Russia should look at US goods or goods produced in Russia by US companies when considering a possible response to new sanctions imposed on Moscow by Washington, Prime Minister Dmitry Medvedev said on Wednesday. The US sanctions, announced on April 6, target officials and business people around President Vladimir Putin in an aggressive response to alleged Russian meddling in the 2016 US election. The sanctions have triggered steep falls in the rouble and some Russian stocks. 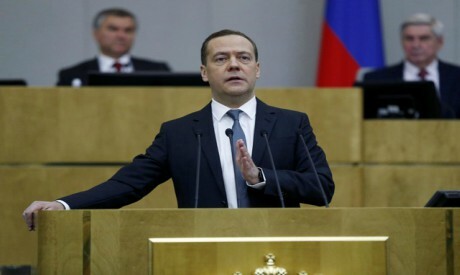 Speaking before Russia's lower house of parliament, Medvedev said the new sanctions were an attempt to capture global markets for US companies. Russia imported $12.5 billion worth of US products in 2017, according to official Russian customs data. That included aircraft, machinery, pharmaceutical and chemical products. Western companies, including Ford Motor Co, PepsiCo Inc and Coca-Cola's bottler Coca-Cola HBC , have also invested billions of dollars since the fall of the Soviet Union to set up local production in Russia. However, Russian state regulator hit US fast-food chain McDonald's Corp. with a string of snap inspections in 2015, prompting it to temporarily shut many of its restaurants, which was widely seen as retaliation for the sanctions.